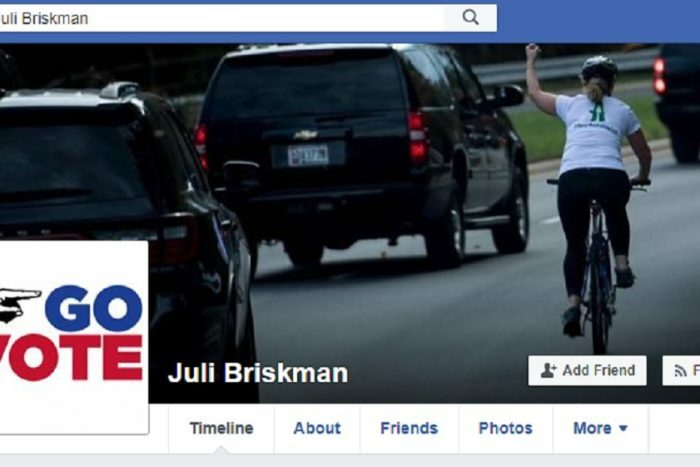 Juli Briskman was out riding her bicycle last month when she was passed on the road by Donald Trump’s motorcade. So, she showed ’em the middle finger. And, it was at that precise moment that a White House photographer traveling with the president as he left one of his golf courses happened to catch the one-finger salute on film. Ms. Briskman became a viral star on social media. Who knew that she would lose her job for it so quickly? The woman on her bike was photographed raising her middle finger when Trump’s vehicles passed her on their way out from the Trump National Golf Club on the banks of the Potomac river, on the outskirts of Washington DC. She repeated the gesture when she caught up with the motorcade. As noted in the White House pool report, “POTUS’s motorcade departed the Trump National Golf Club at 3.12pm, passing two pedestrians, one of whom gave a thumbs-down sign. Then it overtook a female cyclist, wearing a white top and cycling helmet, who responded by giving the middle finger. “Briskman decided to tell Akima’s HR department what was happening when she went to work on Monday. By Tuesday, her bosses called her into a meeting and said she had violated the company’s social media policy by using the photo as her profile picture on Twitter and Facebook. So, I suppose this is where I weigh in. Well, “I told you so.” Actually, there’s more to it than that. If Mr. Met couldn’t come out clean on the other side, what chance did Ms. Briskman have? Sure, Mr. Met’s obscene gesture was captured by a fan at Citi Field, where the Mets play and this one was “off the clock.” But does that matter? Heck no. Just ask Jemele Hill. She’s the ESPN reporter who was suspended for two weeks after tweeting support for a boycott of NFL advertisers. So, it should come as no surprise that a government contractor wouldn’t want its employees engaged in behavior — on or off the clock — to suggest that their employer may be biting the hand that feeds it. “Virginia is an employment-at-will state, meaning employers can fire people anytime and for any reason. But Briskman said what’s been particularly infuriating is that a male colleague kept his job after recently posting lewd comments on his Facebook page that featured (his employer) as his cover photo. 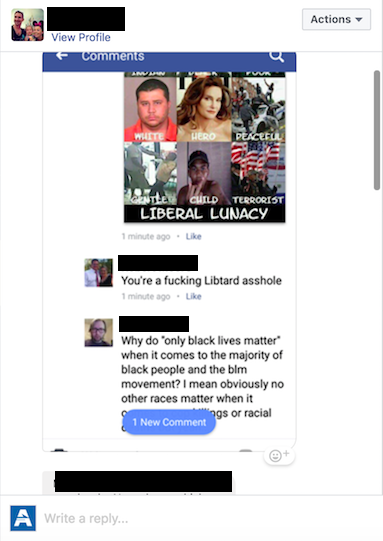 She said this colleague was reprimanded for calling someone (an NSFW incendiary Facebook post), but was allowed to delete the post and keep his job. Ok, there’s smoke. But, how about fire? “That depends,” said the lawyer. Most notably, it depends on whether Ms. Briskman is “similarly-situated,” as we lawyers like to say, to her male colleague. Or, for the layperson, is this an apples-to-apples comparison? Certainly, once Ms. Briskman was identified as the cyclist, her post drew a heckuva lot more attention to her employer than did that of her male counterpart. Also, we have no idea if this male employee held the same position as Ms. Briskman. And what his prior disciplinary record at the company may have been compared to hers. Put simply, there appear to be any number of ways to distinguish what she did from what he did. More often than not, you can discipline (or even fire) an employee for conduct on social media — even on her own time. It’s better to have a social media policy than not. But, whatever policy(ies) you have, enforce them evenly and consistently. Because while most employees are at-will, discriminatory animus cannot motivate that employment decision.